The continuing determination of software developers to virtualise the real world can be seen as either a blessing or a curse, depending upon the perceived benefits such inventions may offer to your particular field of interest. Musicians who work to short-notice deadlines and non-existent budgets (and those of us who delight in techno toys) may therefore be intrigued by the latest aid in the quest to tackle the problem of simulating the most difficult technique to reproduce on a keyboard: strumming. Steinberg started the ball rolling with Virtual Guitarist in 2002, followed by Musiclab's Real Guitar in 2004 and Real Strat in 2007. 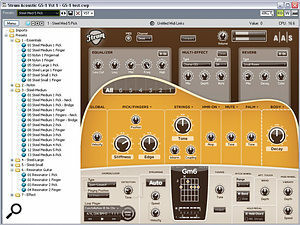 Of these, Musiclab's products are designed to allow for spontaneous real-time 'strumming' by the player, and it is with this same aim in mind that AAS have designed their Strum GS1 software. 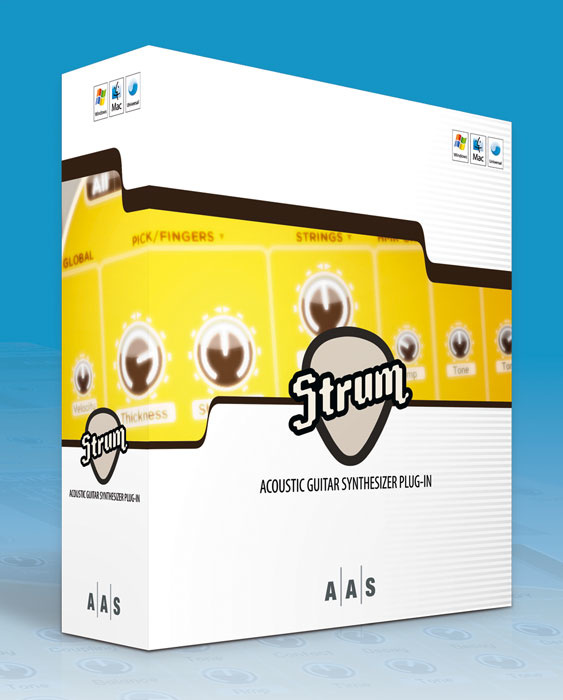 Like Real Guitar, the PC- and Mac-compatible Strum is dedicated to emulating acoustic guitars. However, unlike the Steinberg and Musiclab instruments, which are wholly sample-based, the sounds produced by Strum are physically modelled, having never been anywhere near a microphone, a plectrum or a can of Fast Fret. This is not altogether surprising, since Applied Acoustics Systems are purveyors of other well-known physically modelled instruments such as the Tassman modular synth, Ultra Analogue synth, Lounge Lizard electric piano and String Studio string modelling synth. It is from the last of these that Strum presumably takes its inspiration. One of the immediate benefits of virtually modelled instruments is their scant size, since there are no bloated sample libraries involved. 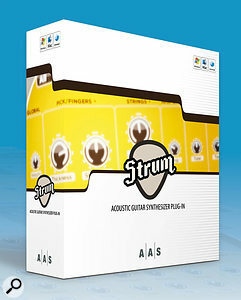 Indeed, if you buy Strum directly from the AAS web site shop it is available only as a download — although boxed versions are available from their distributors. "Less than 12MB to download, seconds to install" says the promotional blurb, and I can't argue with that — apart from the fact that the Windows version is a mere 6.9MB! When the program is first run, entering your serial number generates a 'challenge' code. Registering this code on the AAS web site prompts a 'response' code by return email. Paste this into the program and it's activated permanently. Windows and Mac versions are available separately, and either one includes a license for two computer installations. Strum opens in quite a large 962 x 722 pixel window — if you haven't been seduced into having a second monitor to display your plug-ins by now, perhaps this will clinch the deal, especially if you are confined to the limited screen real-estate of a laptop! The majority of this window is occupied by Strum's controls, while the left-hand area contains the preset browser. This is always visible in the plug-in version and can only be resized or hidden in the stand-alone application. The main instrument area is divided into three sections: the central, guitar-shaped area is where the modelled guitar sound can be tweaked at either 'basic' or in-depth levels — and we'll examine this in more detail later. The upper area is all about on-board sound processing (EQ, reverb and other effects) and the lower area governs the various performance aspects of Strum. Unlike sample-based instruments, Strum presets load as instantly as selecting a synth patch. The supplied presets represent three types of guitar: steel, nylon and resonator. These are sub-divided into several folders, with 'steel' having the most presets overall. Apart from the 'resonators', the guitars come in a variety of small, medium and large flavours, as well as with different pick positions, and all offer a choice of fingered or plectrum tonalities. Interestingly, there are no harmonics, and neither is there a 12-string guitar — presumably the latter would be a more complex sound to model than a six-string guitar. Whether AAS rise to this challenge in the future remains to be seen! You can, of course, save your own sounds to the preset library, and Strum provides all the tools you need to manage, import and export preset libraries. Yes, But How Do You Play It? There is more to Strum than just strumming, so it seems apt to begin by examining the lower performance section. Strum's playing techniques share much common ground with its closest rival, Real Guitar. This essentially involves playing the desired chord shapes with the left hand while 'strumming' them with the right hand using trigger keys. In the case of Strum, the 'chord zone' lies between E2 (note 40) and Bb4 (note 70) whilst the 'trigger zone' keys lie between B4 (note 71) and C6 (note 84). Various techniques for playing Strum become increasingly apparent as you get familiar with the trigger keys and how they relate to the various performance parameters. The Strum interface, showing basic global modelling parameters and the preset browser to the left. This is permanently on display in the plug-in version, but can be hidden in stand-alone mode.Regardless of technique, however, the underlying process is the same: once Strum has detected a chord, it creates an appropriately guitaristic chord voicing, this being also determined by the currently selected chord Type and Playing Position parameters. The chord display in the lower central area shows the current chord's name above a graphical fretboard; Strum is capable of recognising 84 different chord types, in all keys. If presented with a chord not found in its database, the words 'no match' are shown, and Strum will make a valiant attempt to interpret exactly what it is you meant. Strum will also interpret a combination of the root and octave plus an intermediate note (commonly the 5th or 4th) as a power chord. The trigger keys themselves each have specific functions: C5 and D5 are for playing full-bodied 'strums', producing downstrokes and upstrokes respectively. C#5 and D#5 function similarly, but produce palm-muted strokes, while F#5 and G#5 do the same for muffled (or 'scratched') strokes. A#5 acts as a full mute, silencing any currently sounding notes. The six white keys from E5 to C6 behave just like six individual guitar strings — as long as a chord is held, each 'string' can be played individually, allowing for arpeggiated and picked patterns. In this case, the state of the Auto button is of particular significance. If this is left on, any chord or note played in the chord zone sounds immediately — which is fine for when you're strumming, but not so convenient if you wish to arpeggiate a chord using the E5 to C5 trigger keys. Alternatively, when Auto is off, no sound is heard until the trigger keys are played, allowing you to silently voice a chord just before you start to play the arpeggiating trigger keys. This also allows for hammer-ons and pull-offs within a chord without retriggering all the notes (this applies to strumming as well). This 'silent voicing' option is not offered by Real Guitar. In the chord display area, just below the fretboard graphic, are two six-segment bars with movable endstops. These are used to restrict the number of strings that sound during strumming. The upper bar represents 'normal' behaviour, while the lower bar offers an alternative (typically smaller) string range. This range can be accessed in two ways: either by holding down the B4 trigger key whilst simultaneously playing the other strumming keys, or via the Hold pedal function. This helps to add a useful degree of variety to strum density, but it would have been nice (and would sound more naturalistic) to have the string range variable via key velocity, with adjustable sensitivity, as a third method. Perhaps AAS might consider this for a future update? As mentioned earlier, chord voicings are determined by the 'Type' and 'Playing Position' parameters. Type offers five choices. Movable-Root is comparable to playing barre chords with the root note always at the bottom, while Movable-Lowest is for barre chords with the lowest played key at the bottom. The Movable types do not use any open strings, and are especially useful for playing the same arpeggio patterns in different keys. Open-Root and Open-Lowest both use a mixture of open and fretted strings, and are generally sounded using the first three frets — good for that full-bodied 'folky' sound. The Drop-Lowest option produces a lighter voicing of chords of up to four notes. The difference between that and simply restricting the string range is that Drop chords lower the second or third voice of a chord by an octave. The Playing Position parameter only applies to the two Movable types, and allows you to determine the lowest fret on which the lowest note plays. Playing Position settings have to be made manually — there is no Auto position sensing as on Real Guitar, although you can vary the position in real time using a MIDI controller. Pitch-bend range can be set to between one and 12 semitones, with a choice of smooth bends or chromatic slides. One bug came to light here: a smooth upward bend of two semitones finishes up just sharp of a tone, which is clearly unintentional, as all other bend ranges in both directions are bang in tune. Aftertouch can also be used to bend pitch smoothly upwards over a two-semitone range — but again, when Strum's depth sensitivity is at 100 percent, the full aftertouch pressure brings it just a tad sharp. Setting the depth sensitivity to 91.3 percent brings it back in tune. The basic speed of strummed strokes can be adjusted to suit the tempo of your track. Additionally, strum speed can be controlled bi-directionally via velocity, enabling slower strums at lower velocities, with the speed increasing as you play harder, or vice-versa. As well as strumming and arpeggiating, Strum is also quite adept at playing solos, melodies and two-part harmonies. Although the upper range of playable notes ordinarily stops at Bb4, the range can be extended by engaging the '+1 Oct' button. This shifts the chord zone down an octave (the trigger keys are not affected), effectively adding an extra octave at the top end. However, there is a significant restriction. Because playing three or more notes causes them to be detected as a chord, this unfortunately means that Strum cannot be played in polyphonic 'freestyle', unlike Real Guitar, which features a dedicated, fully polyphonic Solo mode. Also in the performance section is Detection Time, which sets the amount of time taken for Strum to interpret a played chord before making any sound. Higher settings are helpful for less sure-fingered players, but at the expense of a noticeable delay. Finally, for invoking vibrato via the mod wheel, controls are provided for setting speed and maximum depth. I was relieved to find that the pitch modulates in an upward direction only, as it would be on a real guitar! It should be noted that none of the performance section's settings are stored within a preset — they operate globally upon the instrument as a whole, and apply to any selected preset. This is frankly baffling, as you are bound to create precise performance settings that suit specific sounds or applications, and will almost always want to recall them along with a preset. Even though all settings are recalled when the Strum plug-in is reloaded as part of a DAW project, you are forced to make performance setting changes manually, when necessary, if you're using Strum as a stand-alone application in a live situation. While some users will be happy to simply load a preset and get on with the music, others will be overcome by the urge to tweak. To this end, Strum provides fairly comprehensive access to its sound modelling engine. The ochre 'guitar body' section is home to seven edit pages, including a 'basic' page that is displayed whenever Strum is instantiated. Pages are selected by clicking on the 'All-6-5-4-3-2-1' buttons at the top of the body. 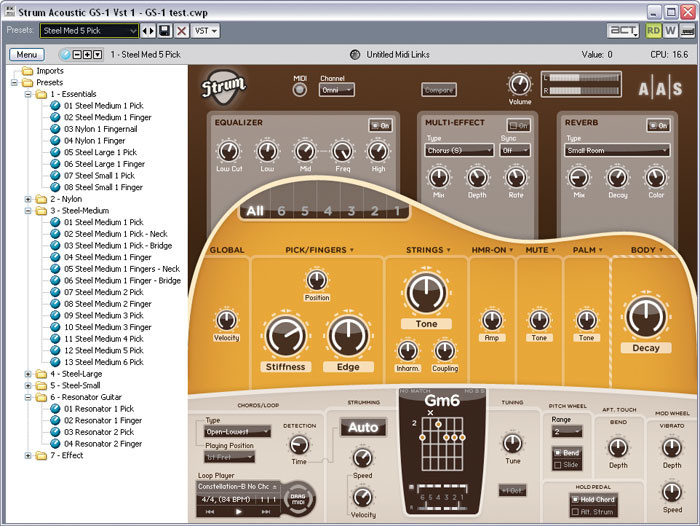 This part of the Strum interface can be toggled between a simple set of 11 controls for all six strings or detailed editing parameters for each string — as shown here.The basic page (All) contains 11 controls that affect all strings, and thus the overall sound. The '6-5-4-3-2-1' buttons reveal detailed, identical controls for each individual string; a total of 30 controls per page. I won't attempt to describe what they all do (the PDF manual explains everything scientifically and at great length) but rest assured you can tweak all the elements that make up the sound to your heart's content. A quick glance reveals control over the sharpness or roundness, stiffness, type, damping and angle of the plectrum/finger; pick position; string gauge; harmonic decay; inharmonic quality; coupling (beating); the characteristics of the palm and muted strokes; body size; and decay — to name just a few. Here it's theoretically possible to create anything from a jumbo acoustic to a charango or ukulele — or something that doesn't even exist in reality. While these are individual string settings, you can apply any parameter changes to all six strings by holding down the Control key while making adjustments. Moving back to the basic 'All' page, you'll notice that its controls are also present on the individual string edit pages. They provide quick access to a selected range of parameters that affect the overall character of the sound, adding or subtracting 'offset' values to the individual strings' parameters. One aspect notably missing from the sound are the squeaks, string releases and other noises that characterise guitar performances, lending Strum an almost pathologically squeaky-clean quality. It's true that some guitarists will go to great lengths to eliminate such noises by recording small sections on parallel tracks, doing drop-ins and spot erasing. Yet in the quest to create believable guitar simulations in the past, I've gone to extraordinary lengths to do the exact opposite! As is often the case with physically modelled instruments, the CPU hit is appreciably higher than their sample-based equivalents. On my ageing 2.4GHz P4 PC system, one instance of Strum consumes an average of 25 percent when strumming at full tilt, compared to around 11 percent for one instance of Real Guitar. Occasional stumbling occurred, notably when changing chords during real-time performance — although this didn't seem to affect sequencer playback. When Strum was running alongside other virtual instruments and the total CPU count had risen particularly high, my sequencer host, Sonar, would sometimes freeze when the song was closed, producing the dreaded 'not responding' message. If I attempted to use the pitch-bender while strumming full chords, Sonar's audio would break up and eventually disappear altogether, even if the CPU meter was running well below the point where you might expect this to happen. The review software otherwise seemed stable enough for a Version 1.0 initial release, and hopefully the above and other issues mentioned will be addressed in updates. Strum's Effects section is divided into three parts: EQ, Multi-effects and Reverb. The equaliser offers three frequency bands: low shelving, high shelving and sweepable mid-range, with all three bands providing up to 15dB boost or cut. An additional method of low-frequency control is provided by the 'low cut' function. This is a high-pass filter with variable cutoff frequency and is very effective in taming much of the potentially muddying low-frequency energy. It often proves to be all you need to adjust to make Strum sit comfortably in a mix. The Multi-effect section's title is a bit of a misnomer, suggesting that several of its effects can be run simultaneously. In fact, only one of its 12 effects can be selected at a time. These include various flavours of delay, chorus, flanger, vibrato, phaser, wah and notch filter. Each has mix, depth and rate controls, and can be sync'ed to the host tempo in a wide range of tempo ratios. The chorus is particularly good, and with the right settings can make up, in part, for the lack of a 12-string guitar model. The Reverb section offers nine algorithms, including small room, clubs, studio, halls and large halls. Mix, decay and color (sic) are the only adjustments possible, but nevertheless a wide range of spaces from tiny, dark rooms to huge, bright cathedrals can be obtained. The reverb is a useful addition, although I thought it sounded rather 'detached' from the main body of sound. My favourite reverb plug-ins (Lexicon Pantheon and Perfect Space convolution) both provide a much more integrated sound, and I would opt to use these in preference whenever possible. So how real does Strum sound? There's no doubt that its similarity to a real guitar is quite uncanny. If presented with this sound in a double-blind test, I would probably identify it as a sample of a guitar recorded via a piezo pickup, due to the extreme cleanness and lack of mechanical artifacts. When you play a chord, Strum will attempt to fit that chord into a guitaristic voicing. The three chord displays here show some possible outcomes: on the left, Strum's best guess at a chord not found in its database; centre and right show how Strum handles an Am7 chord played firstly without the 3rd, then the 5th. Also note the info displays at the top.However, I did find the overall dynamic timbral range to be a bit conservative, lacking the aggressive 'snap' you'd expect when playing fortissimo, especially in solo passages; this aspect comes across much more strongly on Real Guitar. Certain chord voicings also take on a slightly hollow, 'out-of-phase' tonality (depending on the preset) which can be quite tricky to resolve either by editing or using the onboard EQ. Additionally, there is no 'round robin' effect such as those found on sample-based instruments, so repeated notes can sound mechanical. Since no individual string tuning is possible, the tuning is mathematically perfect — which can lend a slightly two-dimensional character to certain chord voicings. Having made those negative comments, I have to say that the general effect of Strum is quite remarkable, considering its completely artificial origin. The sound is at its best when playing big, full-bodied open chords, which have a surprisingly large, sonorous quality. One word of caution if you embark on any sound editing of your own, though: at the risk of sounding like a double entendre, beware of setting the Stiffness and Jut parameters too high, or making them too velocity sensitive. This can result in an unpleasant 'banging' sound on the upstrokes (no, seriously!) and cause them to sound uncomfortably delayed. It is commonplace for rhythm-oriented virtual instruments to include a library of MIDI files in various phrases and styles, together with a loop player to audition them. Strum has just such a loop player, found at the lower left of the performance section. Clicking the small arrow at top right of the loop player opens the MIDI loop folder, within which are eight folders categorised by style. Once a loop is loaded, it can be auditioned from the loop player and, if desired, can be added to your song by dragging the pattern from the 'Drag MIDI' button onto a sequencer track. The MIDI loops are helpful for quick song construction, and also prove very useful to have playing in the background while both hands are otherwise occupied editing the string parameters of the synth engine. If you want to create your own MIDI loops and add them to the library, simply make them in your sequencer, then save as MIDI files to Drive C:/Program Files/AAS/Strum Acoustic GS1/MIDI Library (assuming you're using a PC). You could also make a folder for your patterns, in the MIDI Library folder. Virtually every control and parameter in Strum can be accessed using MIDI messages. Assignments are made in two ways, the first of which is the MIDI Learn method: right-click any control and choose 'Learn MIDI Link'. Alternatively, right-clicking and choosing 'Add MIDI Link' opens a dialogue box in which you manually specify the required MIDI controller. In either case, the minimum and maximum ranges over which the MIDI controller operates can be specified. MIDI Links can be used as a handy method for adjusting any of the in-depth voicing parameters for all six strings at once: simply assign that parameter for all strings to the same MIDI controller. Any MIDI controller maps you create can be saved for later recall. These appear in the preset browser, and are shown in the list with a MIDI icon. If there are any down sides to Strum, they concern its lack of residual guitaristic 'noises', the mathematically pristine tuning and the slightly conservative timbral range, notably at the upper end of the dynamic scale. Its inability to play polyphonic freestyle parts also limits its potential as an all-round guitar simulator, but then it is called 'Strum', after all. Nevertheless, Strum is entertaining and great fun to use, and a valid alternative to sample-based guitar emulations. Comparisons with Real Guitar are inevitable, given Strum's similarities of function and purpose. At the risk of seeming to sit on the fence, I'd say that the two programs complement each other very well. They have distinctly different tonalities — and yes, I did try running the two in tandem, playing similar strummed parts. They make an excellent sound combo, producing a very convincing impression of double-tracked guitars, especially when panned in stereo. When played sensitively, Strum can not only be used as a substitute for real strummed acoustic guitars but also, I suspect, as an effective means of adding support and weight to the real thing. Strum is a relatively 'niche' product, so there's not a huge number of products that are directly comparable.The virtual instruments on the market with proprietary sound engines and user interfaces, like Strum, are Musiclab's Real Guitar 2 and Steinberg's Virtual Guitarist 2. There are other virtual instruments hosted by the Kontakt 2 player that you might also want to check out, namely Chris Hein Guitars (which uses concepts similar to Real Guitar and Strum, with extensive utilisation of custom KSP scripts), and Vir2 Acoustic Legends HD ( less focus on strumming functions). Also worth of consideration are the Audio Warrior Acoustic Dreadnought and Audio Warrior 12-string sample libraries. These two libraries, for Kontakt, Halion and Reason, incorporate the means to 'strum' the samples manually, or play pre-programmed strumming patterns using MIDI loops. Detailed editing of guitar model. Onboard effects and very musical EQ are included. 'Freestyle' polyphonic playing is not possible. Performance parameters are not stored within presets. No string releases, squeaks or other residual noises. AAS's Strum is a virtual instrument using physically modelled acoustic guitar sounds, its primary purpose being the spontaneous performance of simulated strummed guitar parts from a MIDI keyboard. The modelled sound is remarkably realistic, and with care and practice fairly convincing strummed and arpeggiated rhythm parts can be achieved, as well as expressive solo lines.